I first came across this very-hard-to-pronounce-for-a-French-guy wine strangely pronounced, or even butchered should I say, in my Franco-English with a twist of somewhat Italian accent way: "hill-carbo-na-yoneh", when I was a young Sommelier at Monte's Club (on Sloane street) in the late 90s back in London. Established in 1991 in Greve (Chianti) and run by renowned Vittorio Fiore and his wife Adriana Assjè di Marcorà, Podere Poggio Scalette is a classic producer of rich and characteristic Tuscan wines. The slopes of the Greve Valley are indisputably one of Italy's most ideal locations for the cultivation of vineyards and olive groves. The combination of exposure and soil composition contribute to the excellent quality of the wines and the extra virgin olive oils of the area. Named for the river that passes through as it travels from a medieval hilltop town, this area happens to be one of the most important historical centers of the Chianti Classico region. Poggio Scalette takes its name from the landscape which is characterized by dry stone walls that support the terraces on which the vineyards and olive groves are planted. From a distance the impression is of a series of stairs climbing the slopes of Greve. Located on the Ruffoli hill (Greve, Chianti), they bought several plots of land and a rural building from an inheritance division and disposal of several real estate pieces, including farm houses, vineyards, olive groves, pasture and woods, that had been neglected for years, since the death of the previous owner. Initially this led to the establishment of a first nucleus of the Estate, to which, in 1996, another plot was added, following the purchase of the adjacent property, provided with working cellar and extensive buildings, bringing the Estate total area to about 40 hectares. Vittorio and Jurij Fiore, the oenologist-winemakers, produce quite a few wines that have been and remain great examples of excellent Tuscan wines. On a large plot of terraced land named “IL CARBONAIONE” by local farmers, are planted Sangiovese vines that have been the first vines to be planted in 1920, the decade following the end of World War I (1914-1918) and the destruction of most of European vineyards between the end of 1800s up to the early 1930s by the devastating Philloxera. Thus, these vines, that have reached the venerable age of roughly 90 years, are, without doubt, one of the very rare – if not the only – examples of the famous “Sangiovese di Lamole” original clone presence inside the Chianti Classico territory. "Il Carbonaione" is the culmination of knowledge and experience and therefore an important message of quality. Vittorio Fiore dedicated this wine to Tuscany and to Sangiovese; the region and the variety that have allowed him to fulfill his aspirations to produce the highest possible level of quality wine. 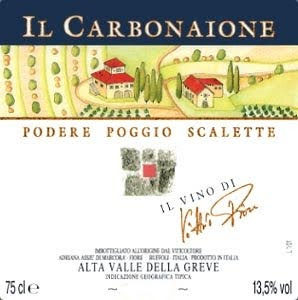 Therefore, "Il Carbonaione" is a unique and distinctive wine produced with 100% “Sangiovese Il Lamole” (a naturally low yielding clone of Sangiovese) from roughly 90 years old vines growing at about 450 meters above sea level (between 1.350 and 1.477 feet to be more precise), from vineyards oriented west-southwest and planted on sandy, silty soils very rich in fractionated stones. During the vinification process, the maceration on the skin usually lasts for about 12 days with manual punch down to ensure greater extraction and concentration of the color, texture and especially flavors. The ageing/maturing process occurs for about 12-14 months in 350 liters Tonneaux (big French and American oak barrels larger than the usual 225 liters Bordeaux barrels or 228 liters Burgundy barrels and close to the 300 liters hogshead barrels used mainly in the new world, yet smaller than the large Slovenian “Foudres” of 18 to 25 hectoliters usually found in the northern part of Italy). The wine spent an additional 6 months in the bottle before release to attain perfect harmony and equilibrium. The resulting wine is a keeper that will remain vibrant and expressive for at least 8-12 years and more depending on the vintage. The 2001 Poggio Scalette “Il Carboniaone” is surely one of my favorite and one of the best that I have tested from this estate, yet the 2001 vintage, like the 2004 and 2007, was excellent overall in Tuscany and in the Northern part of Italy as far as my taste buds are concerned. It combines ripeness, freshness and balance in a convincing and inviting profile from the attack to the lingering finish. At first a bit shy yet still expressive, black berry, earthy, smoky aromas emanates from the glass. After a few swirls, it starts to show off some warmer notes of riper fruit and slight touch of forest floor and mineral. Boasting dark berry, earthy and mineral flavors slightly influenced by the oak treatment, the palate has a great structure and texture, balanced by a good amount of acidity that makes this wine fresher than I expected. In the seamless finish, the youthful tannins are present yet already fairly soft and integrated and suggesting that this wine may need another 5 to 10 years to really settle down and reach perfect harmony. Pair it with earthy and substantial food like game, venison, steak and cheeses. Info taken partially and respectively from the importer website at www.winebow.com and from a PDF format about the wines produce by Poggio Scalette. Ricasoli has roots that can be traced back to the 7th century; however the most important part of their story began in the 17th century and expanded even more in the 19th and 20th century. In fact, for the past 10 consecutive centuries, the property and management of Castello di Brolio, home of the Ricasoli family, has always been maintained by the Ricasoli. In 1993, Francseco Ricasoli took over control over his family’s business and embarked on his project of the complete renovation of the entire estate. Nowadays, the estate is one of the most recognizable estates in Chianti due to its majestic yet somewhat austere medieval castle on a hilltop. It is also one of the leading wineries of this region and their Castello di Brolio Chianti rivals some of the best Chiantis from more notorious producers. In 2006, winter lasted until March. April and May were rainy and the summer showed moderate temperatures and limited rainfall. However, on 20 August the weather changed abruptly and the last 10 days of the month were hot and sunny. This trend continued into September and the first half of October and was characterized by temperatures that varied by more than 10/15 degrees between the scorching days and cool nights. In our opinion, the 2006 vintage is the best to come out of the last 15 years. It displays superb aromatic complexity, good alcohol content and excellent polyphenolic structure. Although quite good and well made yet not so complex or extravagant, Chianti del Barone is basically the entry level of the Ricasoli winery which produces quite a few different labels. The 2006 is made mostly of Sangiovese grapes. Following a fermentation period of 8-10 days, the wine was aged 80% in stainless steel tanks to keep the maximum of fruitiness and freshness, and 20% in oak barrels (two-thirds new) and 900 liters oak cask, to add volume and depth without imparting the taste with heavy oaky notes. It was then bottled in May 2007. 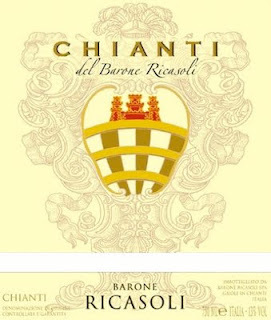 2006 Ricasoli Chianti del Barone is a charming, light, easy going Chianti with fresh red fruit flavors and inviting attitude. Behind its fairly intense ruby red color with purple reflects, the expressive and gentle nose liberates elegant violet notes intermingled with fresh red berries. The palate, although not too complex yet quite juicy, is also soft and voluptuous, with great acidity, earthy undertones and good tannins. A friendly, well crafted Chianti to pair with anything from pasta to pizza and cheeses. Peralada is a small medieval town in the northeastern corner of Spain, where the foothills of the Pyrenees stretch out to the Mediterranean, at a stone's throw of the French Roussillon region. Peralada is located in the centre of the Empordà plain (Empordà-Costa Brava D.O.) a few kilometres from Figueres (a town famous for its Dalí museum). Peralada is a village laden with history. Winemaking in Peralada Castle is documented since the Middle Ages, as witnessed by several papers and parchments from the era that are preserved in the library. The Castle of Peralada (“CASTILLO PERALADA”) is the historical, cultural and commercial heart of the district. As well as the cellars, the Castillo Peralada has a glass and wine museum together with a large library containing more than 80,000 books (in fact, it is the largest privately-held library in Spain). Mr Miguel Mateu bought the castle in 1923 and since then the Suqué-Mateu family has turned the Peralada Group into one of the leading wine producers of Spain. When Miguel Mateu bought this monumental in 1923 one of its main objectives was the revitalization of this winemaking tradition, a tradition that is now more alive than ever and has incorporated the latest technology to produce wines that take full advantage of the nuances of soils and vineyards of the Empordà. Arturo Suqué continued to expand and refined what Miguel began, with the same philosophy and enthusiasm. Pass on from one generation to the next from father to son, the actual owner which also represents the 3 rd generation, Javier Suqué continues the family tradition to produce the best wine possible in a traditional way with a twist of modern technology and appeal. Regrouped in a small area of land, the various vineyards planted in Empordà concentrate a variety of soils that occurs in very few places: slopes of shale, sand plains, sediments of fluvial origin, lands rich in silt and clay, gravel soils ... This heterogeneity of land allows the winery to pick grapes each vintage with a very wide range of shades that allow the development of complex wines full of character, like Castillo Perelada 3 Fincas Crianza y el Castillo Perelada 5 Fincas Reserva. For the elaboration of this wine, Perelada Castle uses grape of 3 of its estate (3 Fincas) located in the Empordà region: Merlot de “Pont de Molins”, Garnatxa and Samsó of “La Garriga” and Cabernet Sauvignon de “Malaveïna”. The heterogeneity of the lands of each one of the properties and the various varieties planted in these 3 properties allow them to search for the best combination to make Castillo Perelada. Empordà D.O. is located in the northeastern corner of the Iberian Peninsula, between France and the sea. The climate is Mediterranean and receives the strong influence of winds, in particular of the Tramontane wind that can reach speeds of up to 120 kilometers per hour. Once again it is very important to stress the great ground heterogeneity of Empordà and its Mediteranean influence to understand the quality and complexity of the produced wines. A blend of carefully selected grapes including 35% Samsó (better known as Carignan), 30% Black Garnatxa (Grenache Noir), 25% Cabernet Sauvignon, and 10% Merlot, this Crianza was aged for about a year in Bordeaux-size (225L) barrels (70% of American oak fine type and 30% Allier French) then spend a bit of time resting in the bottle before release. 2006 Castillo Perelada 3 Fincas Crianza has a bright yet fairly intense red cherry-ruby color with slight garnet reflects on the rime. The nose exposes aromas of mature red fruits, liquorice, mineral and light toasted notes from the oak. The palate is quite fleshy, juicy and balance yet substantial without being heavy due to a great acidity. Present yet fairly integrated young tannins frame and carry, along with the acidity, the ripe red fruit toward the mouthwatering, earthy finish. The tannins are fine and chewy yet a bit young, and could settle down with a bit more time on the bottle. It is a wine that combines a very good mouthful and pleasurable fresh red fruit flavors with a twist of earthiness and slightly oaky, toasted notes. To better understand the diversity of soils and their influence in this wine, we need to dissect it and compare the origin of the grapes, in short: A slight touch of Merlot coming from Pont de Molins confers an attractive color and coolness (acidity) in the palate. The old Garnatxa (Garnacha) and Samsó (local name of the Carinyena or Carignan) from La Garriga, bring the complexity, depth and nuances. And the Cabernet Sauvignon de Espolla is characterized by the elegance of its tannins, as it is demonstrated in this wine. These grapes are the bases for this Castillo Perelada 3 Fincas Crianza and the key to its intriguing yet enjoyable features and flavors. Enjoy this wine over earthy dishes. Wine, in reasonable quantities and without abusing it, is good for your health to a certain extend. Wine is a natural agricultural product that has existed and has been domesticated by men (and women) for at least the past 4-5000 years (and may be more), and so far nobody died from drinking and consuming wine in regular basis in moderate quantity. The natural vitamins, minerals, tannins and anti-oxidant that it contains are really beneficial for your body and blood. Wine also opens your appetite and triggers conversations around the table with friends and family. It also ease business lunches or meetings. If you are stress or tense, a glass of wine is often a good way to de-stress and relax, in front of the TV, listening music, or reading a good book. From Pasteur's point of view, it is the most hygienic drinks of all and I'm sure most of today's doctors and scientists still agree with him. "Human Average Life: 59 years for a water drinker against 65 years for a wine drinker"
In the last 60 years, in terms of vine growing and winemaking techniques, methods and processes, we went from the old days and old natural ways of our great-grandfathers to the nefast and overproducing years right after the 2nd World War, that lasted about 40 years, to the old, more natural ways again since the mid-90s, yet with a twist of modern technology and better understanding of the Terroir and the environment of the vines. In the 50s and 60s, the end of the 2nd World War and the baby boom explosion that increased the world population from approximately 2.5 billions (in the 20s-30s) to roughly 4 billions people (in the mid 60s) multiplied the wine (and other agricultural) production and thus consumption. Therefore, growers and producers, due to an increase of the demand, started to plant vines everywhere without paying too much attention to the type of soil, Terroir, micro-climate, etc.. The idea was to satisfy the demand fast. So, they over-produced and spoiled the soils using chemicals like herbicides, pesticides and unnatural fertilizers. The use of spraying and harvesting with machines was more frequent, although it compromised the quality of the wine, it was faster and somewhat less costly. Those were dark years for some and extremely good years for others. In any case, demand was satisfy with detriment to nature. Greed was here again and has always a destructive factor. Fortunately, by the end of the 80s and beginning of the 90s, researches and studies confirmed the presence of chemical residues in certain wines from certain wine regions, which could be harmful to a certain extend and after long recurrent consumption. It also confirmed abuse of unlawful methods and practices. People started to get upset, pointed fingers and accused these "malfaçons". Things were changing for the better and people's mentality slowly reshaped with the right or more appropriate (should I say) attitude. However, by the mid 90s and beginning of 2000s, population has grown up to 6.5 billions on our little planet and demand still increased. Consumers were more and more knowledgeable and eager to learn and taste more from various regions all around the world. Important and needed researches and studies of the soil's type, difference of Terroir, sun exposition, climate and micro-climate, and more importantly the planting and replanting of the most appropriate type of grape variety, leaded to better quality wines, still massively produced somehow yet with less chemicals and more nature oriented concerns. Since the mid-2000s, after nearly 30 years of specific governmental and non-governmental organization's warnings against global warming, extreme temperature variations, pollutions of all sorts, season's natural cycle changed, melting of Polar ice caps and glaciers, ozone layer, gas carbon emissions, weakening of the planet's natural protecting barriers against the sun, unexplained and misunderstood animal behaviors, more endangered species due to the destruction of their natural habitat, shortage of clean water supply and the various campaigns to return to a greener and more natural way of producing, it is, as it has always been, the agricultural world, those close to nature and the environment, that first heard the call and pulled the alarm. Now in 2010, with about 7 billions people on the planet, and more aware than ever before about our planet scarred ecosystem, but still far from being able to reverse the process yet, the trend of coming back to the natural and biological winemaking and other agricultural producing ways of our great-grandfather, finally settled in the minds of some people that are ready for a change for the better. We are still a minority that are trully interested in the future of our planet and try to listen and act accordingly for a greener, more natural and less polluted world, but we getting there slowly and hoping many more will understand and follow and especially act: by replanting a three where one has been uprooted, using less water, less electricity, less gas and preserve the environment by using greener, organic, biodynamic, sustainable and recycled products. However, the increasing production of more natural, biological and organic wines from sustainable cultures and "Lutte Raisonnée", using less or no chemicals, herbicides, pesticides and more use of fertilizers made with natural composts less harmful for the soils, the wines, the environment and the consumers, is also a sign of the awareness and willingness for people to produce and drink more natural and healthier wines that won't harm their body (or anything else) with unwanted chemical residues and unnatural modified components. Remember, less than 10 years ago, rare where the people who wanted to taste, eat or drink organic products. Nowadays, more and more people want natural products and try to be greener by doing simple acts in their everyday life. In short we can say that wine is getting better after nearly 50 years of trying to modify our great-grandfathers methods, which in fact were much better than anything that we try to invent since the post 2 World War years. The addition of new technology to better understand and better produce was needed and end up by being beneficial for the people to comprehend what we did wrong. Matter of fact, nature and technology are totally compatible when used and blended for the good reasons and progress for the better rather than by greed and financial dividends. always choose a bottle laying down rather than a bottle standing up, unless no choice. a bit of dust on a laying down bottle is not a bad sign, it just means that it never really been moved, which is often better, especially if the store is at constant and controlled temperature. Yet a dusty standing up bottle is always a bad sign and the wine may be bad or oxidized. the front standing up bottle is the last one you should chose for 3 reasons: it is always the one that people take, check and put back on the shelf; it is also the one that receive the most light and wine doesn't like light; the last reason is that if you happen to buy a bottle of wine standing up in retail store where there is not much turn over (and obviously not much business), the cork may have dried and the wine may be oxidized or totally off. a temperature controlled store (or room) will always be better than a store (or room) where the temperature is constantly going up and down which will accidentally accelerate the evolution of the wine in the bottle or even cook it if the temperature is constantly high. A temperature controlled store where the temperature is cool and controlled, is always a good sign; at least it means that the owner of the store cares about the appropriate conditions to display and store his bottles, and try to offer his wines in the best possible conditions. If you happen to shop in a store where the shelves go up to the ceiling, never choose a bottle of wine (laying down or standing up) which is located at the very top shelves near the ceiling of a store (especially if dusty) because during winter, even if the store is temperature controlled, it is where the heat of the room will concentrate and surely deteriorate the wine in most bottles. also, never buy standing up bottles that are located near the windows or opening doors, first for temperature variations which may damaged the wine; secondly for the light which also may alter the wine; and thirdly and more importantly, because if it is really sunny (cold or warm outside), the ray of sun may in any case warm up the bottles and surely deteriorate the wine inside. the best wine retail stores and warehouses are usually temperature controlled or usually have a temperature controlled room, generally in the basement, that they use for the best and age worthy wines that need more time, care and attention. sometimes, wine consultants may be annoying by asking to many times if you need help or if you would like a recommendation or a suggestion, but in my opinion, it is better than a store where nobody cares about you and service comes last. A knowledgeable wine consultant is often more helpful than annoying, and usually he or she tasted quite a few of the wines on the shelves, and should be able to advise you and/or at least point out the wines that will correspond to your taste and/or your need. Along with ripe fruit and tannins, acidity is crucial for the longevity of a wine; as a result a wine that has optimal ripeness, good acidity and tannin structure will surely aged longer than a wine which is over-ripe and full of alcohol or a wine which is lean, acidic and under-ripe. funkiness like animal or mushroomy or musty notes on the nose may not be often attractive, but it isn't necessarily a default. It may have been created by brettanomyces or may be the result of a slight oxidation or wine disease or even slight corkness, only in these specific cases, it is a default. Certain funky aromas and flavors may be created by the environment of the wine in the cellar (unclean barrels, vats or cellar) or in the vineyard (close to a busy road, a factory, etc..) or even by some components in the soil. Acidity is very important for the balance and the freshness of the wine; but if too present in the palate, it can also alter the wine and give it a sour taste, and in some case a puckering sourness which is unpleasant. Acidity never really comes down in the wine, it remains until the end, fruit may drop and the wine may die but the acidity will still be there. Tannins are important for the structure of the wine: they frame all the components has a base for the wine. However, if green, under-ripe or too present and dry, tannins can also alter the wine and give it a green, bitter taste, even sour at time. Tannins should normally mellow down and become more integrated with time and complement the fruit and the overall profile of the wine. Alcohol is an important component of the wine, often indicating the ripeness, the fullness or heaviness, and strength of a wine. Yet, here too, if not well integrated and too present, alcohol may be a default and bring some bitterness to the wine along with an unpleasant firing sensation in the back palate. An harmonious wine, even a rustic or earthy or funky one, usually balances fruit, acidity, alcohol and tannins in such a way that it is pleasant from beginning to the end; it is focus and makes you want another glass immediately. In the bottle, sediments are usually a sign of a naturally made wine that has been bottled without fining or filtration (or just a light filtration). It is not a default and can also be a sign of age, the depot of sediment lay down on the side of the laying down bottle, creating like a stain. This type of wine usually requires a little decantation with or without a fennel (with or without a filter mesh). like I used to do it when I when a Chef Sommelier, you can also help yourself with the flame of a candle to control the sediments during the decanting. If you checked a bottle containing sediments just make sure that you let it rest before decanting it or pouring it, to allow the sediments to slowly fall back down at the bottom of the bottle. Another form of sedimentation can appear at the bottom of the cork under the form of small crystallized shapes, but do not worry, this not a default either. It is just crystallized natural components of the wine, and it is called a tartaric precipitation. It usually occurs, less and less due to new technology and cold stabilization, when a wine hasn't been cold stabilized or when an important change of temperature has happened during transportation or storage (if the warehouse or the wine fridge is too cold). Nowadays, most whites are cold stabilized and the phenomenon rarely happen to most whites but can still be seen with some reds. The change of temperature may have alter the wine a little, but because it is normally caused by lower temperatures, it may just have slow down the evolution of the wine in the bottle rather than damaged it (although if not too recommended, it is not necessarily a bad thing). If the level of the wine in the bottle is low, it may be a sign of age and slight natural evaporation of the wine with time. Yet, in some cases, it may also be the result of a bad storage of a bottle that has been standing up for too long and the cork may have dry up a little. In any case, when you buy a bottle of wine in a store or in a restaurant, especially if it is an old vintage, always ask to see the level of the bottle. Higher neck to up shoulder is usually respectively good to OK, lower shoulder of the bottle could be a problem and the wine may oxidized or even off (yet you will only be able to figure it out by tasting the wine). In the glass, color doesn't mean anything. Some people may say that it is a sign of concentration and heaviness of the wine, well I will say that it is only a sign of extraction of the different component of the gapes contained in the skin (color, tannins, etc..) during the maceration and alcoholic fermentation. Basically, the more concentrate you want the color of your wine to be, the longer the maceration and part of the alcoholic fermentation will be. But color doesn't impart or influence smell, proof is that it exist some very light in color wines that have a lot of aromas and that are very expressive... as you can have very deep, opaque colored wine that are very tight, closed and totally inexpressive (and vice et versa). about the aromas, wine is easily influenced and tend to reflects some of the scents from its surrounding environment: bees and other insects usually pollinate all plants, even vines, and often leave minuscule particles floating in the air. The pollen mixes with the vines flowers and other surrounding scents are also absorbed by the vine leaves, that is why it is not surprising to retrieve some of these natural scents (and components) in the nose of a wine (and even in the taste). In the nose and in the palate, some wines can be fruity, floral, spicy, peppery and more. Toastiness, oakiness, some of the spiciness, smokiness, butteriness, woodiness are usually created by the oak barrels (or vats or foudres) treatments (new oak, used oak) and for how long. Minerality, earthyness, rusticity, animal aromas and flavors are usually created by the components of the soil (sand, stone, earth, schist, gravel, clay, limestone, chalk, slate, etc...) but also by some of the plants and trees around. Bad smell and taste can also created by the vinification conditions in the cellar: i.e. you can have the best fruit ever with the perfect ripeness, yet you can still make a bad wine due to lack of hygiene in the cellar (brettanomyces, etc...) and other bad cellar conditions. Terroir is usually a concept or a notion of factors and knowledge regarding a specific, delimited area that has particular soil characteristics, sun exposure, micro-climate, geographic and geologic typicality, giving the produced wines of this particular area specific and usually distinct character, smell, aromas, flavors and taste. Obviously, here again, wine is very influential and tend to take the best (or the worst) of what its area of origin has to offer. Taste is about as much as the quality of the grape, its specific grape variety, its region of origin and Terroir, its vinification, as it is the desired style of the winemaker. Proof is wines from the same region and even from vineyards close to each other can vary from the lightest to the heaviest and ripest, from the brightest and refreshing to the more alcoholic and tiring, from the earthiest most esoteric to the most crowd pleasing commercial style. Taste is very subjective, that is why one shouldn't only rely on only one critic or magazine or writer, one should learn how to diversify the source of its information and read the opinions of different people to make a decision or really make sure that the wine he or her wants to buy corresponds to his or her taste. The best thing to do is to read and taste as much as you can: to begin with teach your palate with different international white grape varieties (Chardonnay, Sauvignon, Riesling, Pinot Blanc, Pinot Gris, Muscat to start for the whites than slowly move up to Grenache Blanc, Marsanne, Roussane, Chenin Blanc, Viognier, Gewurztraminer, Gruner-Veltliner, Muller-thurgau, Ugny Blanc, Colombard, Gros and Petit Manseng, Macabeo, Alvariño, Godello, Hondarribi Zuri, Garganega, etc...) and for the red (Cabernet Sauvignon, Merlot, Malbec, Grenache, Syrah to start then move on to Tempranillo, Petit Verdot, Cinsault, Carignan, Tannat, etc...). To develop your taste buds, buy 3-4 bottles of wine from different region or even country but made with the same grape variety for you to understand the difference in taste in between the wine. Invite some friends or family to make it more fun and interactive. For example, you could buy some Sauvignon(s) Blanc like a Sancerre, a Pouilly Fumé or even a Quincy (for budget oriented people like me) and compare them with a New Zealand, a Californian and a Chillean Sauvignon Blanc. You'll see it is fun and easy, and you will learn a great deal in no time (as well as the friends and family participating in these tastings). It is the best way to educate you palate: reading a lot, studying maps and geography with a touch of topography if you want to go deeper in the subject, but more especially tasting, tasting, and more tasting. Remember that wine is a fun and enjoyable, often organic or biodynamic, agricultural product that has been around for centuries and that has always been part of the human culture all around the world. As I often say: "I do not sell wine, I sell happiness to people!" Wine opens discussions and debates around the tables of hundreds of thousands houses everywhere around the globe from lunch to afternoon to dinner to after dinner for any occasions. Consume it with moderation and don't abuse it, just enjoy it responsibly the way you want and more importantly the way you feel, 'cause with wines nothing is really written in stone and because tasting is so subjective and personal, no one can really judge you on your own taste buds sensation and reaction. To be continued..... This post is long enough and as usual I wrote a bit too much, but you see, after my little family (my wife and my son) wine and writing are my two passions. I could continue for pages and pages, but I'll stop here for today. Once again, searching for a fortunately forgotten bottle amongst my precious bottles that I normally keep for special occasions, I found a wooden box, a untouched "coffret", containing 3 bottles of Sequoia Grove from the 2002 vintage: 1 Cabernet Sauvignon, 1 Chardonnay and 1 Cabernet Sauvignon Reserve; that was offered to me 3 or 4 years ago. Sequoia Grove vineyards was founded in 1978 by Jim Allen, whose love for European wines inspired him to look for the perfect place, leading him to the Napa Valley. Surrounded by its purple hued mountains, Sequoia Grove Winery sits on 22 acres right in the heart of the valley floor in an important region referred to as the Rutherford Bench. Here the alluvial soil, rich in minerals, combined with the fog from the bay, mingling with the warm inland temperatures create the ideal location to produce their award winning Cabernet Sauvignon. Michael Trujillo, their Director of Winemaking and President, has been with Sequoia Grove since its beginnings joining the team in 1982. Winemaker Molly Hill overseeing daily operations and quality control. Together Michael and Molly share the same passion for excellence, and have forged great relationships to acquire the best Napa Valley fruit available. These Bordeaux-style wines show varietal expression, structure and balance with a true sense of place; a fresh approach yielding modern-day liquid treasures. Sequoia Grove wines are made with 100% Napa Valley fruit from the original Estate vineyard and the newly acquired Tonella Estate Vineyard in Rutherford, as well as from premier Napa Valley Growers throughout Napa County. 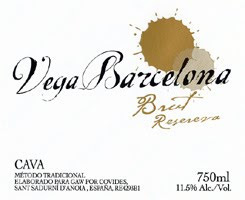 The Fruit: Ideal harvest conditions in 2002 produced grapes with full maturity and intense flavors. The Napa Valley Cabernet Sauvignon is made from estate-grown grapes as well as neighboring growers Gary Morisoli, Bill Collins, Beckstoffer, Traina, Garvey and others all within the Rutherford, Oakville and Napa Districts of the Napa Valley (60% Rutherford, 30% Oakville, 10% Napa). Vinification: All fruit is hand-sorted and crushed to the fermenter where each individual wine is to be fermented. After a gentle pressing, the wines are transferred to 100% American oak barrels – 40% of which is new – where the wines undergo and finish secondary malolactic fermentation. Finally, the wines are blended and further aged in barrels for a minimum of 22 months prior to bottling. Tasting Notes: Generous aromas of currants and blackberries are offset by impressions of black olive, clove and spice. On the palate, rich, full flavors of ripe dark fruits, black cherries and dark chocolate are supported by fresh acidity and a restrained, elegant tannic structure. With a velvety finish, it is approachable now and will only improve with more time. I thought: "He, it has been a long time since I wrote something on a Californian wine; let's open it and see how this "twice the horsepower" Sequoia Grove 2002 Cabernet Sauvignon has evolved in the bottle. As soon as I opened the slightly-dry-at-the-top cork (strange because these bottles have been laying down for quite some time in their box...), "volutes" of liquorice, old prune scents with a slightly musty touch, evolved in the environing air. I let it breathe for a little while. In the glass, its color is quite deep and intense, red garnet with dark orange-brick reflects in the rime. It also seems to have quite a few sediments (no filtration? bad storage?...). I even put it close to the light to witness minuscule rounded floating red sediments, almost like if the wine was pigmented with multiple red dots swimming around. After a few minutes in the glass, the same profound and expressive old prune, dark wild berries, liquorice, forest floor, cider wood (or sequoia in this case may be), spicy, earthy aromas came out warmly from the glass with a slight touch of alcohol. To use a metaphor, it was almost like walking in the red wood forest by a warm Indian fall afternoon, breathing the different scent intermingled with dark fruit, earth, mushroom and almost smoky notes in the air. Boosting 14.2% of alcohol, this wine attack is clean and inviting yet ultra-ripe, creamy and woody with very dark, jammy fruit, earth and spice. The mid-palate is really generous, fairly balanced at first and expanding nicely for the first half, with even more ripe dark fruit, almost scorched fruit, dark chocolate (Michael was right on this one too), more earth, spice and toasted oak. The second half that leads toward the finish is somewhat less attractive, slightly rough and a bit angular, fortunately the acidity is persistent and balances it, although at some point the wine seems to have a down curve before the finish. Despite the gorgeous and lingering ripe dark fruit and chocolate flavors, the woody finish possesses some dry tannins with some alcohol, which brings, (IMO), some bitterness (or even sourness if you ask my wife) in the back palate. The tannins seems quite young still and may need a few more years to integrate. One thing is sure, this wine still has some good ageing potential due to its tannins. Overall, the wine is not bad, very ripe, fairly juicy and fairly balanced, but not as harmonious or integrated as I thought it will be after a few years in the bottle. It is a big fruit bomb, with a lot of chocolate, toasted oak and alcohol, fortunately with some decent acidity to lighten and balance it and somewhat round some of the angles. Although I buy some of these wines for my customers at the store and I still appreciate some of the featuring aromas and flavors in this one, it is not necessary my style, no offense to the winemaker or the winery, but the alcohol in the finish is a bit of a put-off for me. You see when I taste them and sometime, if rarely, buy them, I must comprehend and appreciate them for what they are but I don't enjoy them for myself, that is one of the dilemma of a wine-buyer like me (because even if I need to be open minded to any wines and any styles to offer a wide array of wines from all around the world to my customers, from the driest, earthiest, leanest and acidic to the ripest, woodiest, more alcoholic juice out there; I still prefer my wine to be more harmonious, balanced, fresher and juicier with more minerality, integrated tannins and less alcohol). Big Cabernet lovers should enjoy this wine very much. I'll suggest to open it at least an hour before you drink it, because it seems to round up and get slightly more open and easy to drink after now about 30 minutes of opening. It will need something substantial like a grilled steak. Don't get me wrong, If I was living in Napa Valley, enjoying the warm weather sitting outside with a glass of this wine, breathing the fumes of a juicy steak or burger grilling next to me with a few friends and family around, I'm sure that it will change my point of view and my way of drinking this wine. May be, I'm too impatient and should let it breathe a little longer, or may be, I'm not used to this type of wine anymore. The Rioja, Ribera del Duero and some Bordeaux wines that I drink from time to time, may have this type of body and strength, or even the alcohol, but I need to admit that too much ripeness and heaviness in the glass get me tired very quickly and I can't enjoy the wine as much as I would love to. Moreover, as a good wine lover, I like to finish my bottle and try different wines within the same meal, any wine above 14-14.5% of alcohol will get me on my knees quick and make me sleepy, but any wine below 14% will surely enhance my mood and my meal and my conversation, and I will have no problem to sip it and appreciate it and of course finish the bottle. 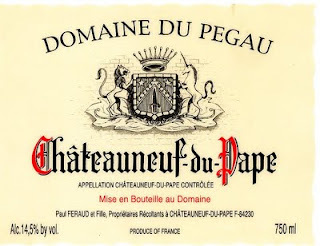 Domaine de Pegau has a long family tradition of growers that can be trace back to the 17th century and is one of the benchmarks of the Chateauneuf-du-Pape appellation. The great grandparents of Paul Feraud expanded the Domaine Feraud (as it was known before it became Pegau) to 22 hectares. In 1964, Paul decided to produce his own wine from selected 5 hectares of vineyards and bottle it at the property; the remaining wine was sold in bulk to Negociants. A new Chapter opened when Laurence the daughter of Paul and wife Odette, having finished her wine studies came back to work with her father. In 1987, the Domaine Pegau was created to associate the experience and respective talents of father and daughter. The family tradition of winegrowers and winemakers will be ensured by Laurence and her husband Mark and their two children Maxim and Justine (names that already adorn the bottles of two private prestige Cuvees). They now craft several earthy, balanced, generous and expressive wines, from the Chateauneuf-du-Pape appellation (and Cotes du Rhone), divided in 11 vineyards within the appellation which contribute to the diversity of taste, personality and character of each of their wines. Chateauneuf-du-Pape "Cuvée Réservée", usually made from 75% Grenache, 20% Syrah and 5% Mourvèdre, Counoise and other varieties. After a few months in steel tank, it is then aged for around 18 months in old oak foudres (huge wooden barrels). Chateauneuf-du-Pape "Cuvée Laurence" is basically the same wine as the Cuvée Réservée but it is kept in wooden cask for another 18-24 months before being bottled (certain Cuvees spent up to 4 years, like the 1995, according to their website). Chateauneuf-du-Pape "Cuvée da Capo", made in the same way as Cuvée Laurence but from the very best wine from the cellar. Chateauneuf-du-Pape Cuvée Inspirationi, a fairly new Cuvee, I couldn't find much about it. Cuvée Réservée Blanc Made mostly with Grenache Blanc and is aged for 6 months in small barrels. “Vin du Table” Plan Pegau From vineyards right outside of the appellation from Pegau. “Pegau” is an Old Provencal word from the “Langue d’Oc” (the ancient language spoken in the south and southeastern part of France which gave its name the vast region of Languedoc), which was the name of ancient wine jugs excavated from the old 14th century Pope palace in Avignon. Like the “Cuvee Reservee”, “Cuvee Laurence” is the flagship cuvee of Domaine de Pegau, aged for 18-24 months (and up) in old “foudre” (big oak vats). The 2004 “Cuvee Laurence” offers great, expressive earthy aromas of cassis, black cherry, lavender, wild herb with hints of earth, black currant and ripe fig. In the palate, this refined, charismatic, young wine is earthy, rich, robust yet delightful and balanced, with a very good tannic structure that will need a bit of time to settle down. The garrigues, pot pourri, earthy profile linger in the long, structured finish. It is a keeper that will evolve slowly and open nicely within the next few years. If you can’t wait decant it and wait for it for at least 30-45 minutes. Over the last decade, I visited many times this property during the "Bordeaux en Primeur" campaign, during the month of April. Tasting at the barrel the current vintage (which happened quite rarely at this estate, because usually one only tastes the "echantillons" that have been prepared for this special occasion for the press and the trade of wine buyers and critics from all around the world who come especially to estimate and speculate on the "futur" vintage every year). Although a bit difficult of access and not always open for appointments, it is still worth visiting and tasting if you can get an appointment with Nicolas Thienpont or even the busy Stephane Derenoncourt, who I had the pleasure to met in many tastings and lunches, and more especially at the tasting of "La Grappe"(a tasting regrouping most of the estates advised by Stephane Derenoncourt from around the world, usually held at Chateau Rol-Valentin, an estate owned by ex-professional football player Eric Prissette, also worth tasting and visiting if you can). The wines at Pavie Macquin are rather rich, opulent yet harmonious and balanced with a lot of depth. The tasting usually includes some of the other wines from the other estates owned and managed by the Thienpont Family, with the exception of course of the most famous Pomerol "LePin". Owned by the Corre family, who since 1995 have contracted Nicolas Thienpont to manage the estate, and advised by the renowned oenologist, Stéphane Derenoncourt, Pavie Macquin is one of the leading Chateau of Saint Emilion, situated on the top of the plateau overlooking the town. 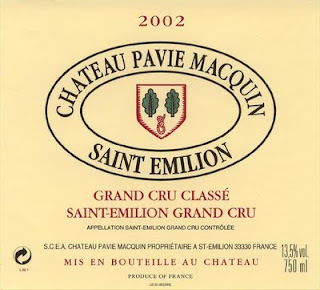 On the occasion of the reclassification of the Saint Emilion chateaux (in September 2006), Chateau Pavie Macquin was promoted to the prestigious level of Premier Grand Cru Classé. The 15 hectares are planted with 80 % Merlot, 18 % Cabernet Franc and 2 % Cabernet Sauvignon of 35 years old in average vines growing on clay-limestone on chalk soils. The vineyard work and vinification process is totally organic with biodynamic approach. The vinification process occurs in 80% wood and 20% cement vats, followed by a 16 to 20 months ageing period in oak barrels of which 80 % are new and 20 % 1 yr old. From the classic 2000 vintage, this bottling is now collector and worth the high price. This wine is exhibiting the quality, intensity and complexity of the old Merlot vines. The palate is concentrated, rich, voluptuous and extracted with present yet already fairly integrated oak tannins that will need a bit of time. The natural methods applied in the vineyard and the vinification process brought a lot of earthiness, minerality and depth. For those of us who have patience, it is an excellent wine to cellar.